Field crops account for more than 80% of the cultivated land area in Imperial County. 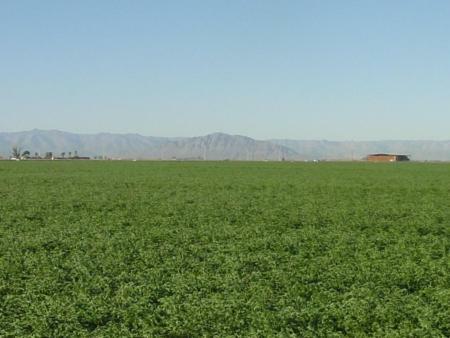 Field crops use the vast majority of irrigation water in the Imperial Valley. In the future, the implementation of water conservation technologies and mandated reductions of irrigation water will present a major challenge for the producers of field crops. The dependency of the US economy on the importation of foreign oil is a major concern for the nation. In order to reduce US dependence on foreign oil importation, ethanol production has been promoted in the US. At the current time, almost all ethanol production in the US is derived from corn fermentation. Farm advisors and specialists conduct research at the UC Desert Research and Extension Center and work in commercial fields to evaluate alternative crops for local ethanol production. This program involves investigations in alfalfa, wheat, and sugarcane varieties for adaptation to desert conditions. Fertility and nutrient analysis studies are conducted on alfalfa and wheat to improve fertilizer use efficiency and improve water quality. Different methods of application of phosphorus (P) to alfalfa are investigated to determine Best Management Practices for reducing P contamination of drainage water entering the Salton Sea. Crop production cost guidelines are compiled on the various field crops to assist growers in maintaining an awareness of the inputs for crop production.